On Sunday, June 18 beginning at 3 pm at the Purchase College Performing Arts Center, the Philharmonic welcomes Westchester-born conductor Andrew Litton, who was recently named Music Director of the New York City Ballet, to lead a Father’s Day season finale concert of Weber, Tchaikovsky & Dvorak. Immediately following the concert, audiences will grill with the Phil at an outdoor Father’s Day celebration for the whole family. The 3pm concert program opens with Weber’s Overture to Euryanthe then, Maestro Litton teams with the orchestra and guest pianist Conrad Tao in an all-time favorite, Tchaikovsky’s Piano Concerto No. 1, followed by Dvořák’s beloved New World Symphony and its familiar English horn solo. 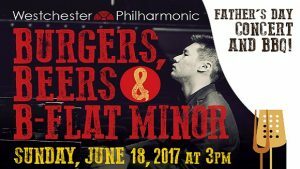 Father’s Day celebrants will enjoy a post-concert Phil tradition: Burgers, Beers & B-flat Minor. Join conductor Andrew Litton, pianist Conrad Tao and members of the orchestra for a fun-filled Father’s Day BBQ celebration right after the concert. Featuring cold beer from Captain Lawrence Brewery in Elmsford plus burgers, hot dogs, soda and sides. Including live bluegrass music and a chance to mingle with the artists. One hour before the concert, listeners are also invited to a preconcert discussion of the program with Andrew Litton and Conrad Tao led by Artistic and Executive Director Joshua Worby. A free open rehearsal is scheduled for 11 am on June 18 in the concert hall. Children and families welcome. The performance will take place in The Concert Hall at The Performing Arts Center, Purchase College, 735 Anderson Hill Road, Purchase, New York. A pre-concert discussion with the artists takes place inside the concert hall simultaneously at 2 pm. Single tickets range from $40-$97. BBQ tickets are $25 adult/$12 children and include beverages, burgers, hot dogs, sides, dessert and entertainment. College student/group discounts are also available. Call the Westchester Philharmonic Box Office at (914) 682-3707 ext. 10 or visit westchesterphil.org. Visa, MasterCard, American Express, Discover Card accepted. A free open rehearsal with the orchestra is scheduled for June 18 at 11 am in The Concert Hall. Children and families welcome. Coffee and doughnuts will be served backstage for “Phil Families”. Please visit westchesterphil.org for information before attending. This entry was posted in Press Releases and tagged classical, dvorak, orchestra, piano, tchaikovsky, Weber. Bookmark the permalink.